TimeFusion is the solution for integrating your scheduling software with Infusionsoft. 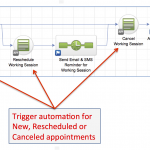 Save time and automate appointment scheduling! Are you using TimeTrade or Full Slate to give your clients and prospects online access for setting appointments with you? Automate with TimeFusion! TimeTrade or Full Slate and your Infusionsoft account can work together. TimeFusion is the solution for integrating TimeTrade or Full Slate to Infusionsoft. TimeFusion is a cloud software solution that provides one-way syncing between TimeTrade or Full Slate and Infusionsoft. With TimeFusion, appointments set or changed through TimeTrade or Full Slate are automatically set or updated in your Infusionsoft calendar. Plus, any automation you can set up in Infusionsoft can be launched by TimeFusion when an appointment is set, rescheduled, or canceled! The contact that booked the appointment is added to your Infusionsoft app if a contact record cannot be found for them. TimeFusion uses the contact’s email address to search for them in your Infusionsoft account and creates the contact record only if necessary. The appointment is attached to the contact record and installed in the correct User’s Infusionsoft calendar. Changes to existing appointments (cancels and reschedules) are also handled by TimeFusion and the existing appointment is located and updated automatically. 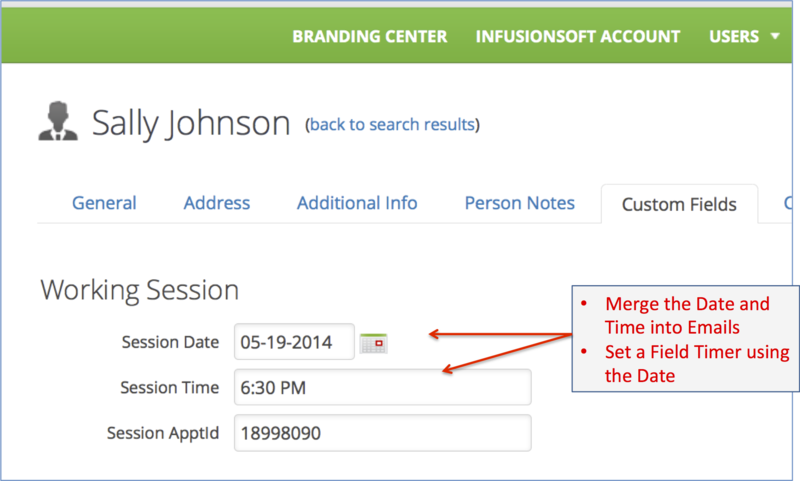 Capture new leads and have them automatically added as contact records in your Infusionsoft app! Your prospects & customers can schedule, reschedule or cancel appointments and those changes are automatically synced and updated in your Infusionsoft calendar! TimeFusion Lite is right for you if your goals are lead capture and calendar integration. If you also want to trigger campaigns that communicate, apply tags, set tasks, etc. then scroll down to learn about the more advanced versions of TimeFusion. With TimeFusion Standard, you can go further and leverage the power of Infusionsoft automation by triggering an Infusionsoft campaign goal/sequence when new appointments are set. Use the campaign to automatically acknowledge the appointment and follow up with advance information and meeting reminders, or use the goal trigger to stop a sequence and begin another – since you know the appointment has actually been set. One TimeTrade Activity type for new appointments is supported in Standard, and the appointment date and time values are captured to custom fields of your choice. The date field can then be used in your campaign field timers and the time field can be merged into email reminders. There are no limits on TimeTrade Activity types supported by TimeFusion Unlimited, and also no limits on Full Slate Service types. Each Activity/Service can trigger your campaign goals for newly set, rescheduled & canceled appointments. Every Activity/Service you have configured in TimeTrade or Full Slate can be associated with a different set of campaign goals and custom fields in Infusionsoft. Date and time values can also be captured into separate custom fields for each Activity type – use them as merge fields and for campaign field timers. 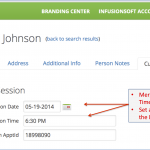 You can choose whose Infusionsoft calendar the appointment is installed in. With Lite and Standard the appointment is always installed in the calendar of the User who owns the Contact record. With Unlimited you can optionally choose to always install the appointment in the calendar of a designated User. Zero Setup in TimeFusion. Just create your TimeTrade Activities or Full Slate Services and then follow some simple rules to name your custom fields and campaign goals in Infusionsoft, and TimeFusion Unlimited will perform the integration between them with zero additional setup. TimeFusion Unlimited automatically configures itself to the settings you have created in TimeTrade, Full Slate and in Infusionsoft. Helpful videos walk your through it. TimeTrade allows you to pose a question to the client when they set an appointment. With Unlimited the answer to that question can be captured to a custom field of your choice. TimeTrade Unlimited will automatically create your GoToMeeting reservations and store the details into your custom fields for you to merge in to your emails. This will save GoToMeeting users much time because you can choose any or all of your TimeTrade Activities/Full Slate services to be automatically integrated to GoToMeeting. Check out the Videos page to watch videos showing the creation of a campaign in Infusionsoft that integrates with TimeTrade or Full Slate using TimeFusion Unlimited. Click this link to download a 1-page comparison of TimeTrade and Full Slate. *Attendee timezone is not supported by TimeFusion with Full Slate. If your appointment attendees are often in a timezone different than yours then Full Slate may not be well suited for your needs. TimeFusion Messenger brings the full appointment automation capabilities of TimeFusion Unlimited and adds innovative SMS messaging capabilities that are tuned for the needs of small businesses. 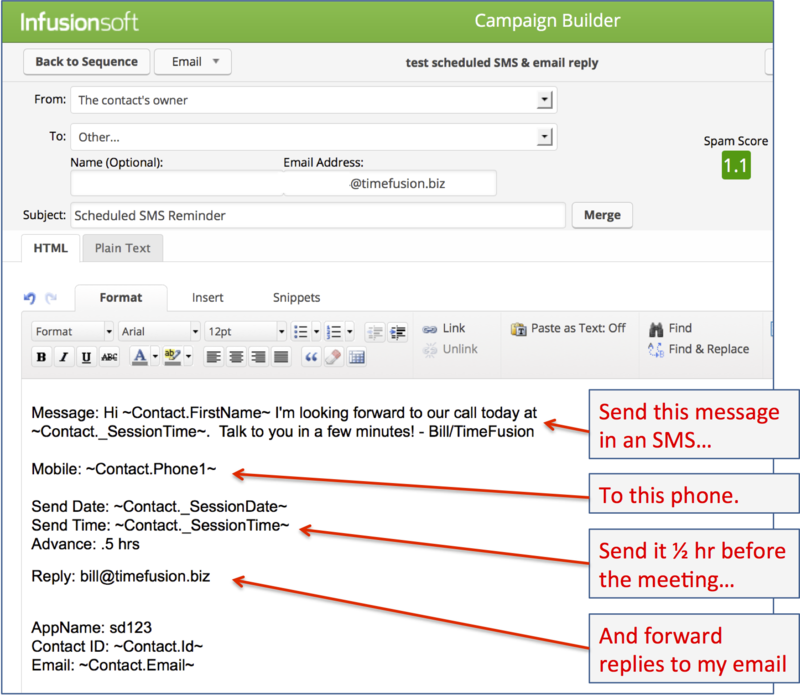 And the price for TimeFusion Messenger makes it the most cost effective SMS messaging service available in the Infusionsoft marketplace, even if you don’t use the appointment automation features. 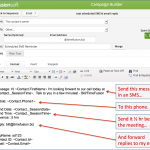 Send an SMS using an email sent from an Infusionsoft Campaign. Unlike other services that require an HTTP Post to send an SMS, you do not construct your message inside the service; instead you create the message, including merge fields, as a normal email in an Infusionsoft campaign and send it to a specially assigned email address. 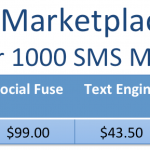 Lowest total cost of any competing SMS service in the Infusionsoft marketplace. Compare the total cost to send 1000 messages/mo and see that TF Messenger is 25% less than the next option and only 1/3 the cost of the most expensive option. Replies to your SMS messages can be routed to an email address or by SMS to a smartphone so you can personally reply back. Many Small Businesses don’t have a use for automated reply handling – what they need is the ability to respond to their customer’s when their customers are saying something. TimeFusion Messenger provides that ability. Precisely schedule an SMS to be sent at a specific time. For example, you can have an SMS sent as an appointment reminder 30 minutes prior to an appointment that was set up through TimeFusion. This is perfect for reducing no-shows!